One of my favourite Harry Potter characters, especially in the movies, is Luna. I like her because she just doesn’t give a damn what people think of her. Like, she knows they think she’s weird, but she doesn’t change for anyone. She still rocks the Spectrespecs and the dirigible plum (radish) earrings. She’s stays true to herself, no matter how much opposition she faces. I honestly almost cried the first time I read it. She has a such ‘I really don’t care if I have friends or not’ attitude throughout the whole series, to see that, in reality, her friends are the most important things in the world to her, was so emotional. I guess we all take friends for granted, these days, they’ve become a sort of ‘of course I have them, I’m human’ thing, so to be shown someone who truly appreciates her friends, who sees their real value, is something so rare it’s beautiful. Often described as the anti-hermione, Luna relies on emotions and faith to form her beliefs. For the most part, she doesn’t care about facts, as seen in her insistence of the existance of Crumple-Horned Snorkacks throught the series. I think this is another reason why she’s so epic. She almost represents the child in all of us, the child who refuses to believe something doesn’t exist, the child who thinks that if you believe in something hard enough, it might just be real. I find it sad that as we age we lose this trait, so it’s a refreshing change to see a teenager who still possesses it. 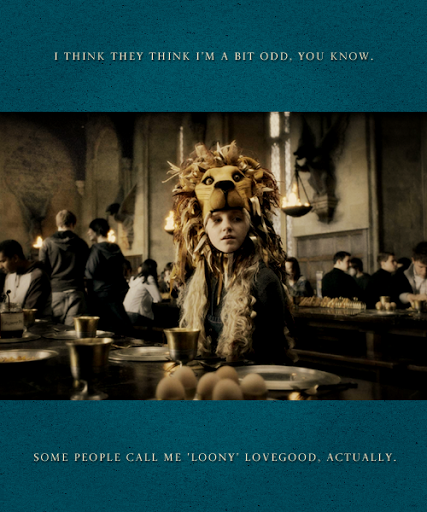 As odd as Luna is sometimes portrayed, I honestly believe we all should act a little bit more like her. We need to stop caring about the opinions others have of us, and stop basing all our ideas on facts. It’s time to stop giving a damn and start believing in fairies and unicorns again. It’s time to hang radishes from our ears and sunflowers in our hair. It’s time to take a leaf out of Luna’s book and actually live. ps. I still think it’s a travesty that Neville and Luna didn’t end up together. Like the new blog layout!I always thought there should have been more of Luna in the books, because P.S It was a travesty that Neville and her did not end up together.